Production Time: 10 business days, Size: 5/8 " x 36 " - 5-Day Rush service available! 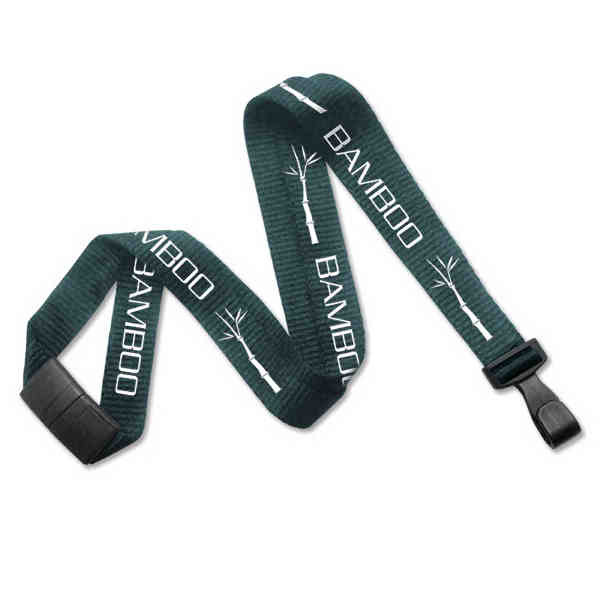 These eco-friendly lanyards are made from bamboo, one of Earth's most sustainable resources. They're extremely strong and durable, yet comfortable to wear all day. Standard delivery lanyards come in 3 widths, with your choice of 6 popular end attachments and 9 material colors made from plant-based dyes or natural (no dye). 5-Day version is available in 2 widths, in your choice of black, navy blue or forest green. 5-Day comes with a wide plastic hook and includes a free breakaway (see breakaway warning and warranty below). Breakaway available for standard delivery lanyards for an additional charge. Customizing is done with Earth-friendly, water-based inks, in your choice of 12 imprint colors. Size: 5/8 " x 36 "
Price Includes:1-color, 1-sided custom imprint; choice of attachment; free shipping. 3/8" x 36": 2 lbs. per 100 pieces. 3/4" x 36": 3 lbs. per 100 pieces. 5/8" x 36": 4 lbs. per 100 Pieces. Price Includes: Breakaway is subject to special terms; see Additional Information.